EOS is a cryptocurrency project aiming to provide a scalable blockchain platform for decentralized applications. After raising 4+ Billion USD in a token sale, the EOS platform is now live and has the potential to scale to millions of transactions per second. In this guide, we show you how you can buy EOS instantly. So if you are looking for the best ways to buy EOS, then this article is for you. Launched in 2013, Changelly was founded with the goal of breaking down the barriers to cryptocurrency adoption by providing a platform where customers with little to no knowledge on cryptocurrencies can still invest without hassle. 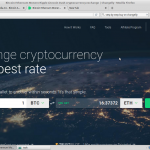 As a cryptocurrency exchange, Changelly has developed a reputation as a beginner friendly platform where cryptocurrencies can be purchased practically instantly with a credit card — bypassing many of the tedious steps typically associated with cryptocurrency exchanges. As it stands, Changelly has already managed to attract well over a million customers to its platform, thanks in part to its low fees and extensive selection of supported digital assets. Currently, Changelly remains one of the small minority of platforms that allow you to buy EOS instantly with a credit card. 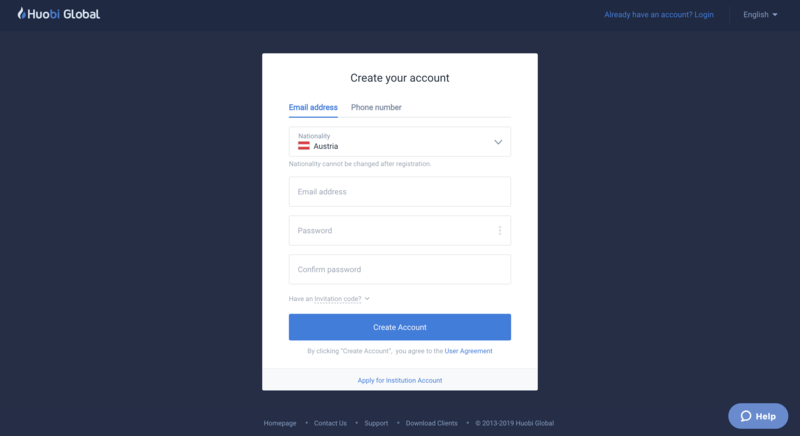 To begin the exchange process on Changelly, you first need to create an account. To do this, click the ‘Sign Up’ button and enter your e-mail address before clicking ‘Continue to exchange’. 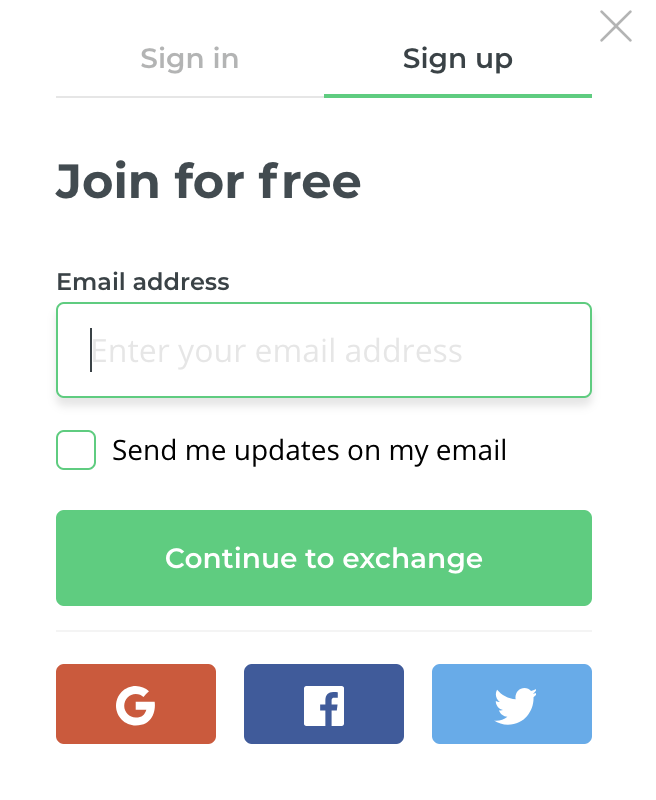 Changelly will send you an e-mail which you will need to click to confirm your account. After following the e-mail link you will be automatically logged in and directed to the exchange interface. 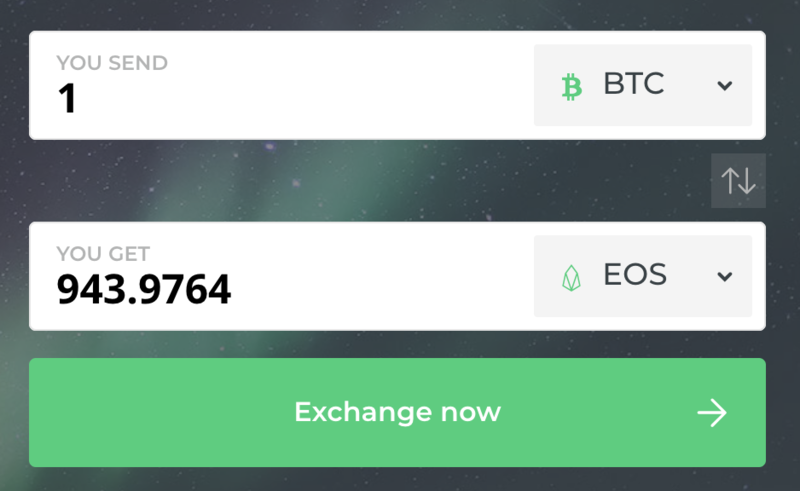 In the top bar select the cryptocurrency you are looking to exchange for EOS, while in ‘YOU GET’ field select EOS and entity the quantity you would like to purchase. Next, click “Exchange Now” and proceed to step 2! Now, you’ll need to enter the address you want to receive your EOS to. Simply type in, or paste your EOS address into this field, being sure to check this carefully. Note that if you are using an exchange address, you will likely need to use the ‘Add memo’ option to enter your memo also. 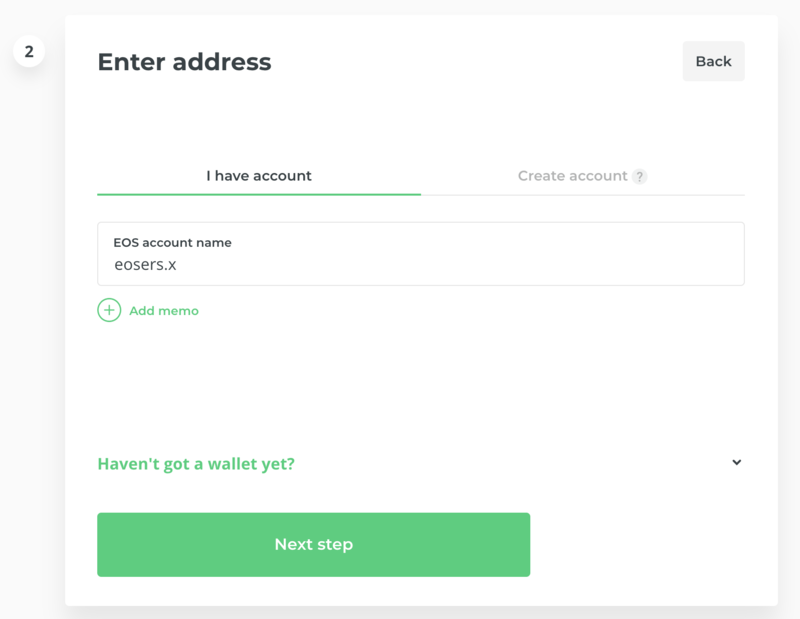 If you don’t yet have an EOS address yet, click the ‘Haven’t got a wallet yet?’ option below to create one through one of the suggested websites, before returning to fill in your address as described above. After entering your EOS address, click the ‘Next step’ button to verify your order details. 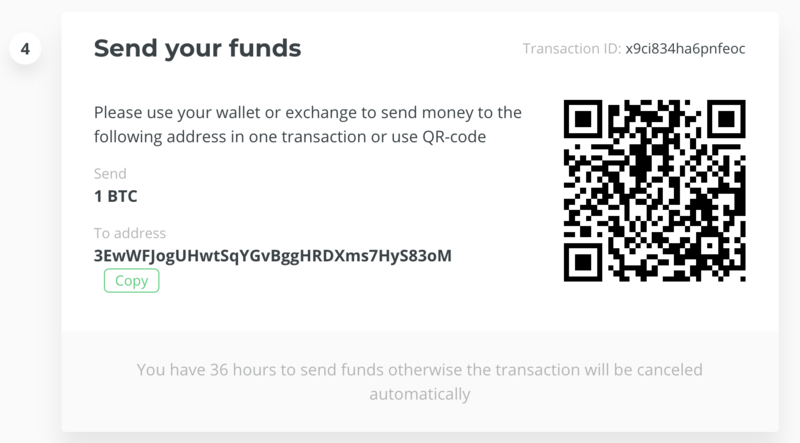 Here you’ll be shown the final order details, including the fees that will be charged for the exchange. If you’re happy with the details, click the ‘Confirm and make payment’ button to proceed to the last step. 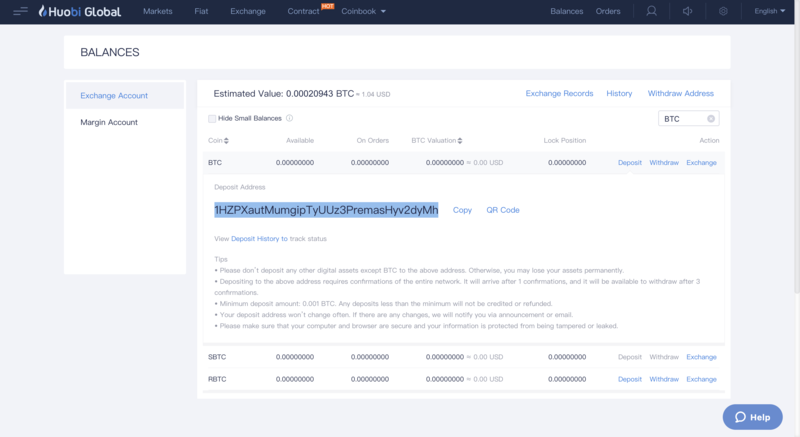 In the last step, Changelly will provide you an address to send the agreed payment to, this will be in the cryptocurrency you selected earlier in the exchange process. 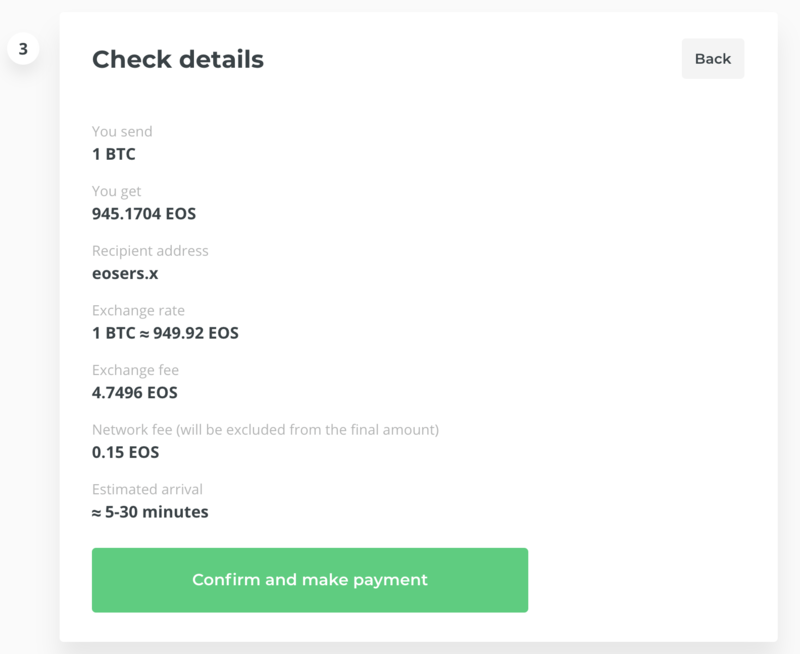 Simply send the amount shown to the address provided, and Changelly will automatically send you the agreed amount of EOS to the address you provided in step 2. That’s it! Changelly usually completes orders within 30 minutes, so your balance should be visible in your EOS wallet in 30 minutes or less. If any exchange needs no introduction, then it’s Binance. Since its launch in 2017, Binance has gone on to become of the biggest sensations in the world of crypto, with its meteoric growth catapulting it into the position of the world’s largest cryptocurrency exchange. Part of the reason Binance is so popular is down to its innovative fee model, which provides traders a way to significantly reduce their trading fees by holding and paying with the exchange’s native token – Binance Coin (BNB). In addition to this, Binance also offers a tiered fee schedule that sees it’s already low 0.1% trading fees reduced for high-volume traders. This, in combination with its extensive digital asset selection and huge trading volume make Binance tough to beat. 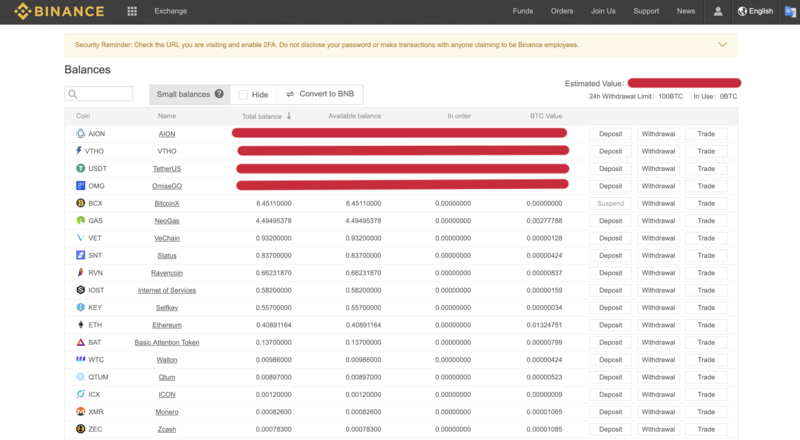 To begin the process of purchasing EOS, you first need to create a Binance account by clicking the ‘Register’ button. Fill in the required information, and click the link provided in your confirmation e-mail to activate your account. 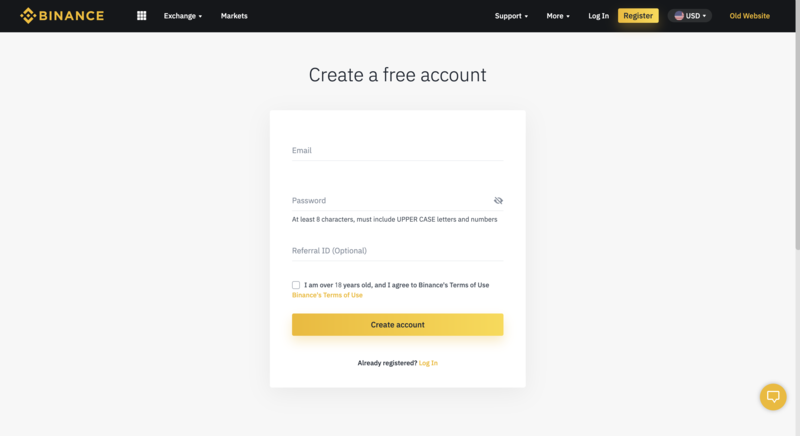 As it stands, Binance only requires KYC verification for accounts wishing to withdraw more than 100 BTC worth of cryptocurrency per day, so you should be free to trade right after registering. Once registered, log in and head over to the deposits section in your account, where you will be provided a list of supported cryptocurrencies. As it stands, the most popular EOS trade pairs are EOS/USDT, EOS/BTC and EOS/ETH, so we recommend depositing either Tether (USDT), Bitcoin (BTC) or Ethereum (ETH). To do this, search for one of these options in the search bar on the top left. Once the correct option is visible, click the ‘Deposit’ button to display your address — this is where you will need to deposit your funds from your external wallet. After depositing, your funds should be visible in your account after reaching the minimum number of confirmations, this value is shown beneath your deposit address. Once your funds have reached your account, the last thing left to do is place your buy order for EOS. To begin, click the ‘Exchange’ button, and select the ‘Basic’ option to open the trading interface. 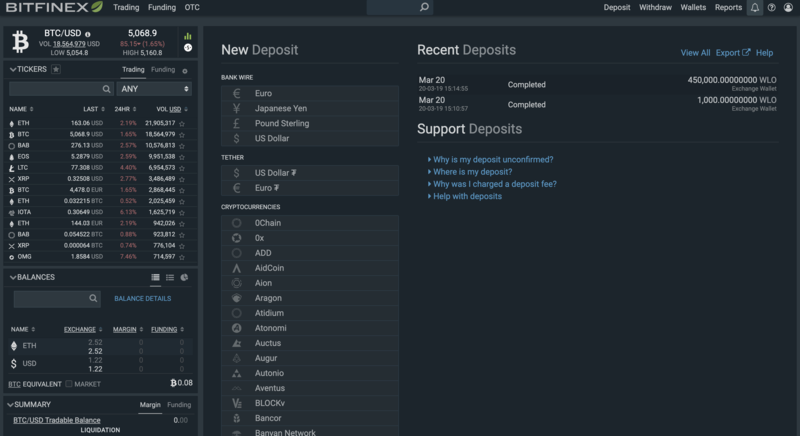 Here, search for your desired trading pair using the panel on the right by selecting your deposited cryptocurrency, then searching for EOS using the search bar. After selecting the trade pair, you can then place a buy order for EOS. Here, you’ll be able to enter the amount of EOS you are looking to buy, and the price you want to buy EOS at. 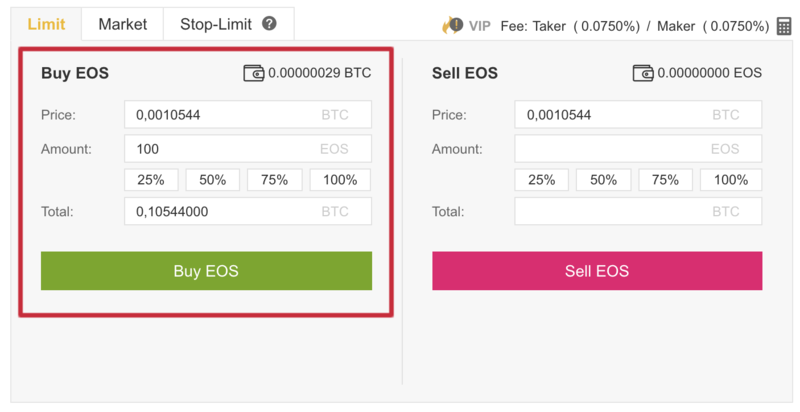 If you’re happy with the price, click the ‘Buy EOS’ button to place the order, which will automatically credit you with the amount of EOS you purchased. Easily the oldest exchange on this list, eToro was launched way back in 2006 as an online social trading platform. However, the platform only recently branched out to support cryptocurrencies, making it one of the newest exchanges on the market in this regard. Despite being relatively new, eToro is already good enough to trade blows with the heavyweights, thanks to its gigantic community and the huge number of financial instruments it allows its users to trade, with cryptocurrencies being just part of its extensive offering. To get started on eToro, you’ll first need a trading account. To create one, navigate to the ‘SIGN UP’ section of the website and complete the required information. Once your account is created, you’ll be able to login and complete eToro’s verification requirements by clicking ‘Complete profile’ on the top left of the website. Here you’ll need to provide some personal information including your name, address, national insurance number, and proof of your identity, in additional to answering questions relating to your trading history and employment. 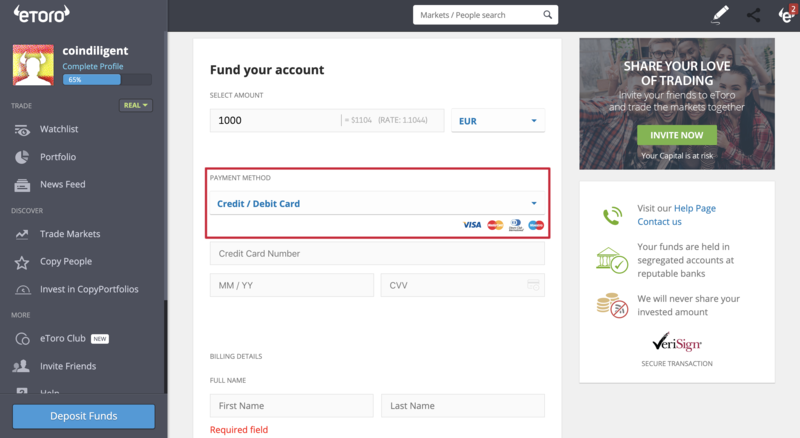 After you’ve completed the required verification steps, it’s time to deposit some EUR or USD to your account. To do this, click the ‘Deposit funds’ button to open your funding panel. Here, you’ll be provided a range of deposit options, with eToro being one of the few platforms to let you buy EOS with credit card and PayPal. Select the deposit option that fits you best, fill in the required fields and click ‘Submit’ or ‘Continue’ to finalize the deposit. Once your deposit is available in your eToro account, the last thing left to do is place your EOS buy order. To do this, click the ‘Trade Markets’ button and select the ‘Crypto’ tab. Scroll down and select EOS before clicking the blue ‘Trade’ button on the right. After clicking ‘Trade’ the trading panel will pop up. Here, select the ‘BUY’ tab at the top, enter the size of the order in the ‘Amount’ section, and click ‘Open Trade’ when you’re happy with the parameters. This will automatically deduct your EUR or USD from your balance, and credit you with the equivalent amount of EOS. If you’re feeling particularly adventurous, you can also add more advanced rules to your order, such as adding leverage or a stop loss. When it comes to choosing where to buy EOS tokens, there are usually several considerations you need to make. The most prominent of which is usually how quickly you need to make the purchase, as this often has ramifications as to what kind of fees you can expect to pay, and whether you’ll need to complete KYC in the process. Because of this, we highly recommend looking through several different options before making your choice, because the difference in costs and functionality between exchanges can be considerable. 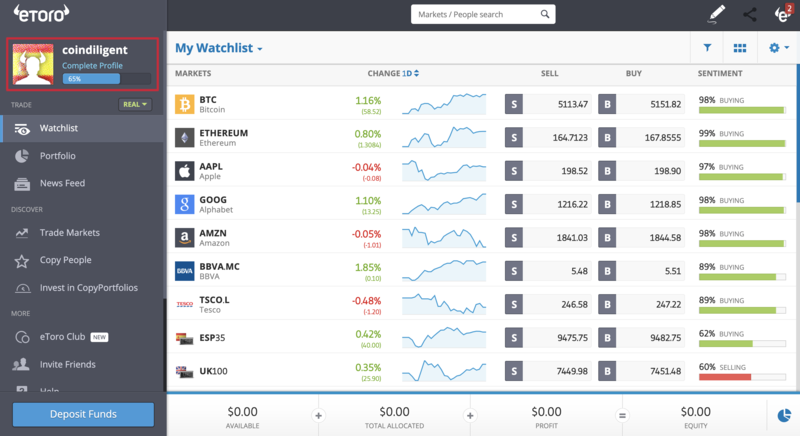 Although Binance, Changelly and eToro will be sufficient for the great majority of investors, there are dozens of other platforms out there that offer features that are worth a look. While we can’t cover them all, we can cover some of the ones we think are the most promising. Billing itself as the world’s largest cryptocurrency exchange, Bitfinex certainly has big boots to fill. Although we’re not sure how it can claim to be the world’s largest exchange considering Binance exists, it certainly is big, regularly achieving several billion dollars in monthly trade volume across 115+ markets. In total, Bitfinex offers 10 base currencies trade against, including four fiat currencies, and two stablecoins, making it an excellent choice for both casual and professional traders. Bitfinex is also one of the few exchanges to allow you to buy EOS with USD, GBP and EUR, with EOS/USD, in particular, featuring excellent liquidity, as the 5th most popular trading pair on Bitfinex. 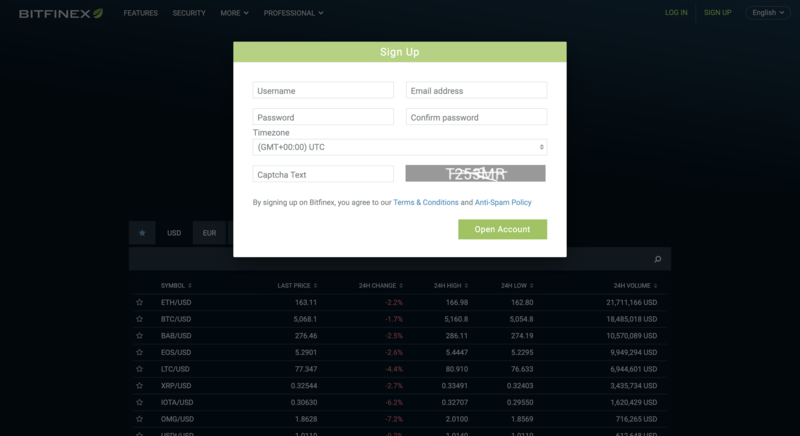 To begin, head over to the Bitfinex website, click ‘SIGN UP’ and enter the required information to create your Bitfinex account. Once registered, proceed to log in, head over to your account and go to the ‘Verification’ section to complete the KYC steps needed to activate deposits and withdrawals. To complete verification, you’ll need to supply information including your name, residential address and phone number, in addition to proof of address and two forms of ID. Once this has been submitted, you should be verified within several days, though Bitfinex remarks that this can take up to 8 weeks. 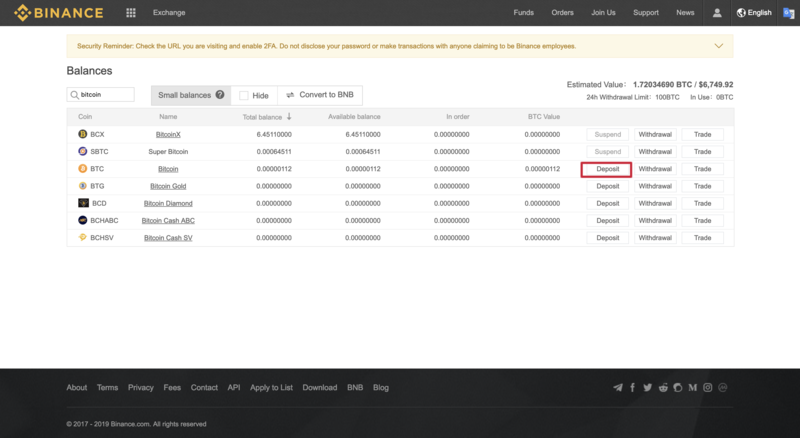 Once verified, you can then make a deposit to your Bitfinex account via the ‘Deposit’ section. Here you will find the information required for your deposit, allowing you to deposit either fiat using a bank transfer, or cryptocurrencies (like Bitcoin) from your external wallet. Once your deposit appears in your account, you can move on to ‘Trading’ section. Here, search for and then select your EOS trading pair on the left, and place your EOS order using the order form on the left of the charts. Launched in 2011, Kraken is one of the oldest cryptocurrency exchanges still in operation, and has garnered an incredible reputation in this time thanks to its excellent security, varied deposit options, and prompt customer support. Widely regarded as one of the leading exchanges for crypto to fiat trading, Kraken has gained an excellent reputation for its BTC to USD/EUR trading, which sees impressive volume. Currently, Kraken offers EOS trading against BTC, ETH, EUR and USD, with its EOS/EUR trading pair being the most liquid. First off, you’ll need to register an account via the ‘Create an account’ page. Once this is created, you’ll be able to login with your username and password and begin verifying your account. Once logged in, navigate to the ‘Get Verified’ section, and complete the required verification steps. Note that you will need to complete up to Tier 2 verification to enable EUR deposits/withdrawals, whereas Tier 3 is needed to enable USD trading. Once deposits are enabled, simply head over the Deposit section on the top right, and select the currency you are looking to deposit on the left. Follow the on-screen instructions to complete this process. Once your deposit is confirmed, head over to the trading panel and select ‘New Order’ to begin the trading process. Here you’ll be able to select your EOS trading pair and place a variety of order types, allowing you to buy EOS coin with a variety of currencies. Another exchange billing itself as the most advanced cryptocurrency exchange is HitBTC, which again, probably isn’t the world’s most advanced exchange, but is definitely a platform worth considering. As it stands, EOS is the fourth most commonly traded digital asset on the HitBTC, with the exchange regularly seeing close to $100 million in daily trade volume for its EOS/USDT and EOS/BTC trade pairs, making it a great choice for EOS investors. To purchase EOS on HitBTC, you’ll first need to register for an account, before heading over to the deposit section by clicking the green ‘Deposit’ button. 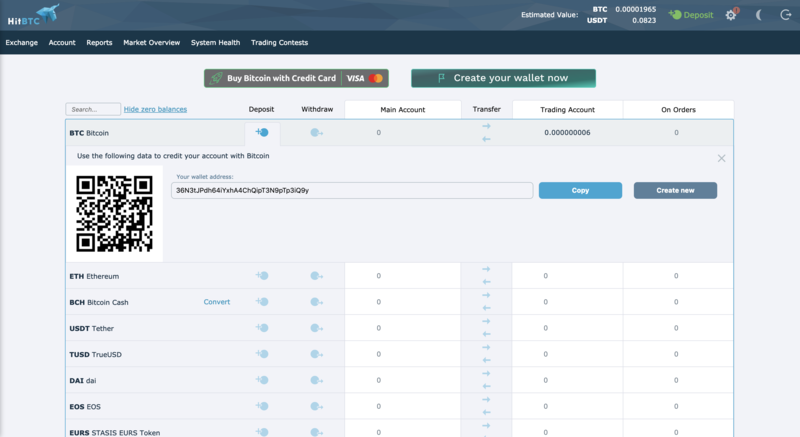 Here you will find all of your personal wallet addresses, allowing you to top up your HitBTC account with BTC, ETH or USDT, each of which can be later traded against EOS. 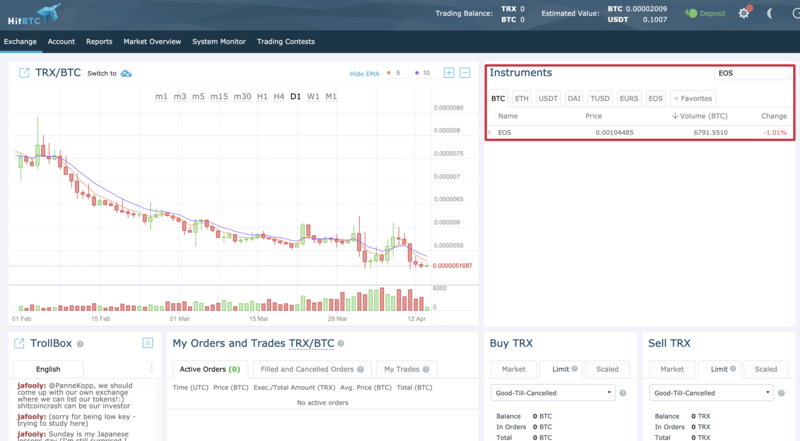 Once you have loaded your account with the appropriate cryptocurrency, head over to the exchange section on the top left. In the trading panel, select your desired trading pair on the right. Once selected, you will be able to place a variety of order types below, allowing you to purchase EOS instantly with a Market order, or at later date at a specific price using a Limit order. As one of the top 10 largest cryptocurrency exchanges, Huobi Global is clearly doing something right. Ranging from its low trading fees, easy-to-use trading platform and extensive trading pair selection, to the excellent liquidity it provides, Huobi leaves little to be desired from an exchange. Since its launch in 2013, Huobi has gone to great lengths to be one of the most expansive trading platforms available, and currently features over 400 trading pairs, with EOS being tradeable against USDT, BTC, ETH and Huobi Token (HT). To begin purchasing EOS on Huobi Global you’ll first need to create your account using by clicking the ‘Sign Up’ button and filling in your details. 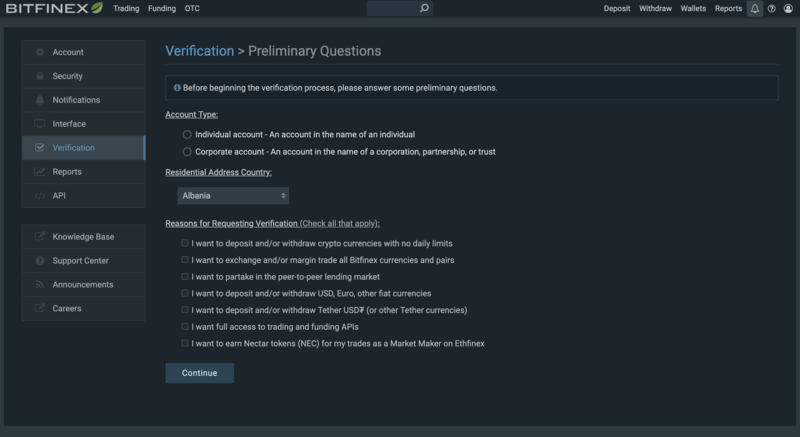 After registering, log in, and hover over your profile to find the ‘Verification’ open, click this and complete the required verification steps to enable trading on your account. After several days your verification should be confirmed, and you’ll be able to deposit USDT, BTC, ETH or HT to your account via the ‘Deposit & Withdraw’ section under the Balances button. 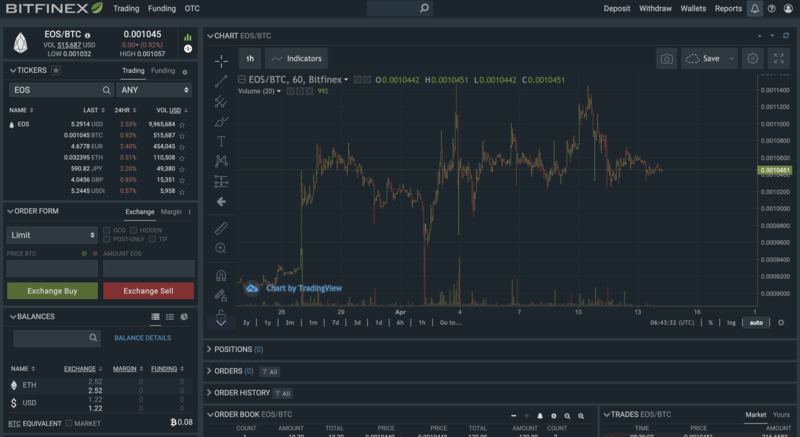 To complete the exchange process, head over to the ‘Exchange’ tab, search for your desired EOS trade pair on the top left and place your order using the trading panel displayed on the bottom right of the trading interface. We have already covered the best exchanges to buy EOS at, let’s now take a look at the available payment options to buy EOS. You have three main options to buy EOS with Credit Card: Changelly, Binance, and eToro. Each of the above has its advantages and disadvantages, but in short, if you want speed then use Changelly, if you want low fees then use Binance, and if you want simplicity then use eToro. The above-mentioned platforms that enable you to buy EOS with Credit Card also enable you to buy EOS with Debit Card. The only difference is that, depending on your card provider, your fees could be slightly lower if you use a Debit Card to buy EOS instead of a Credit Card. At the time of writing, the two best ways to buy EOS with a Bank Transfer are Bitfinex and Kraken. Although both platforms are geared towards traders and the user interface is not very intuitive for beginners, Bitfinex and Kraken are also some of the cheapest ways to buy EOS due to their low fees. Both exchanges offer an EOS-USD pair, and Kraken additionally also offers an EOS-EUR pair which is important for European investors. The only way to directly buy EOS with Skrill is through eToro, where Skrill is one of the supported payment options. However, as stated earlier, keep in mind that eToro does not enable you to withdraw your EOS to your own wallet. If you want to hold your EOS in your own wallet, then you need to take the following two steps: First, create an account on Bitpanda and buy some Bitcoin with Skrill. Second, send the Bitcoin to your Binance account and use it to buy EOS! Unfortunately, there aren’t many avenues yet to buy EOS with PayPal. Your only option is eToro if you want to make use of this payment option. However, keep in mind that eToro does not allow you to withdraw your EOS to an external address. This means that you could buy EOS on eToro and profit if the price goes up, but you wouldn’t be able to store it on your wallet and use it for payments. To buy EOS with USD and Cash you need to follow 2 steps. First of all, buy some Bitcoin with cash on Localbitcoins. To do so, you will have to meet in person with the individual that the platform connects you to. Secondly, simply send the Bitcoin that you purchased with cash to Binance and use it to buy EOS instantly. The original authors of the EOS protocol are software programmer Daniel Larimer and American investor Brendan Blumer, who in 2016 founded Block.one — the company which developed EOS and began offering EOS tokens to the public in 2017, netting over $4 billion in investments in the largest ICO of all time. In many ways, EOS is similar to Ethereum, since both were designed to support smart contracts and decentralized applications (DApps). EOS, in particular, was designed with efficiency in mind, providing developers with a decentralized operating system to support commercial-scale DApps, while providing the EOS token as a unit of value for operating these DApps. Unlike its main competitor Ethereum, EOS does not use proof-of-work (POW) to secure the blockchain. Instead, it uses a novel consensus mechanism called delegated Proof-of-Stake (dPoS) which sees EOS token holders vote for block producers (BPs), who are tasked with creating and signing new blocks. Currently, there are a total of 21 EOS block producers, which were selected based on the number of votes they received during the continual selection process. The 21 miners that receive the most votes will become block producers, and act to maintain the integrity of the blockchain. Many of these block producers reinvest their block rewards into the EOS community, development and growth of the EOS network to ensure its prosperity. One of the main features that distinguishes EOS from other blockchains is its resource allocation model. Rather than paying for individual transactions, EOS users instead purchase or rent resources from the network, with all EOS accounts being allocated a certain amount of CPU and NET based on the amount of EOS staked. RAM, on the other hand, is purchased on the internal RAM market, with its value being subject to supply and demand. If there’s one thing about EOS that cannot be denied, it’s the commitment to the long-term viability of the platform, with several different mechanisms in place to ensure EOS thrives regardless of the circumstances. By allowing EOS holders to vote for who they believe to be the best block producers (BPs), the protocol allows its community to directly influence the direction of the blockchain, since only the block producers that offer the best value-add to the system will be selected, while underperforming BPs will be replaced. Beyond this, transactions on the EOS network are free of charge, with the costs of interacting with DApps instead being shouldered by the developers. Though the costs of creating an EOS account can be an obstacle for some people, while the hassle of purchasing RAM and renting CPU and NET can be a further annoyance. Moreover, since the costs of interacting with most DApps is incurred by the developers, launching and maintaining DApps on EOS can be very expensive, being massively more expensive than launching a DApp on competing blockchains such as Ethereum or Tron. This can be cost prohibitive for smaller projects, resulting in the EOS DApp ecosystem mostly being dominated by large scale, high-volume gambling DApps. Despite its costs, the EOS DApp ecosystem has grown dramatically since the EOS mainnet launched in June 2018. Currently, there are several hundred DApps in operation, many of which see several million dollars in weekly volume. As it stands, EOS is currently the second most popular DApp platform, quickly catching up to its main competitor — Ethereum. The EOS blockchain is capable of handling in excess of 3900 transactions per second (tps) in its current iteration, while Ethereum tops out just north of 20 tps, Because of this, many would argue that EOS is better suited for commercial DApps that may need to process in the millions of transactions per day. Overall, since its launch, EOS has generated a remarkable return on investment for ICO participants, with the EOS token being worth as much as $22 — equivalent to 22x the ICO price, making it one of the most profitable ICOs of all time. Going forward, it can be argued that decentralized applications still have huge room for growth, and with EOS as one of the frontrunners in this race, it stands to reason that as one of the most advanced blockchains, EOS could stand to greatly benefit from this growth. What is the best EOS wallet? After you bought some EOS, the next step is for you to store it somewhere safely. Some people will chose to leave their EOS on an exchange, however, as history has shown, exchanges often get hacked and investors lose all their coins. Hence, you should opt for the much safer alternative which is to use an EOS wallet. There are two main types of EOS wallets: Hardware wallets and Software wallets. The best EOS hardware wallets are the Ledger Nano S and Trezor One. We reviewed both of them here so make sure to check it out before using any of the two. On the other hand, the best EOS software wallets are Atomic and Freewallet.